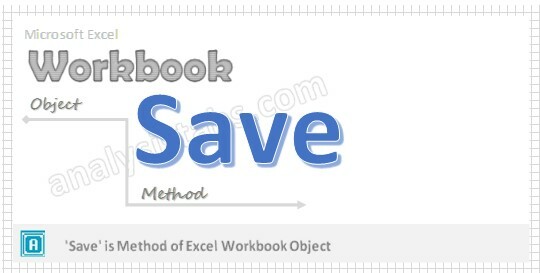 We can save workbook by using ‘Save’ method of workbook object in Excel VBA. Please find the following brief description about save method of workbook object. Why we need to Save a Workbook using VBA? Why we need to Save Workbook using VBA? When we do any changes in Excel workbook then we may want to save the changes for further reference. So that only we need to save workbook to see modifications when you open your workbook next time. It Saves changes to the specified workbook. Here is the syntax to save workbook using VBA. In the above syntax we are using ‘Save’ method of workbook object to save the workbook. Please find the below example, It will show you how to save workbook. Explanation: In the above example we have created variable named Wkb in the first statement. We have used ‘Add’ method of workbook object to add new workbook and then assigned it to object named Wkb in the second statement. At last in the third statement we have used ‘Save’ method of workbook object to save newly created workbook. Please find the below example, It will show you how to save active workbook. Note: Here ActiveWorkbook object represents the workbook which we currently activated. Now you can observe that your Active Excel workbook is saved with the changes.